Though our Deco Belle Millacreli rings are crafted of 925 nickel free sterling silver and Murano glass, please remember that they are still fragile and to be handled with care. 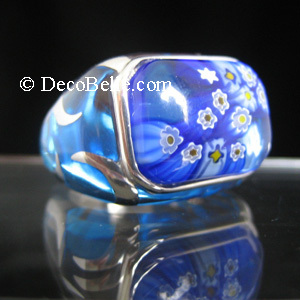 Impacts, exposure to water, and such may compromise the bond between the glass top and the adhesion to the ring. The special glue used to hold the glass top to the ring frame may not hold up to water exposure. 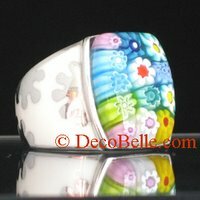 Here at Deco Belle, our founder has worn her multi color Millacreli ring nearly every day for a year and a half, dropped it several times when taking the ring off to show a curious passerby (even on concrete and hardwood floors! ), and it has sustained no damages, completely intact and unscratched. The Millacreli ring has never been polished as it is nickel free, and rhodium plated. It is as shiny as the day it was purchased! But care to minimize exposure to water and avoid hard impact has been taken. Shop with confidence with our low price gurantee!